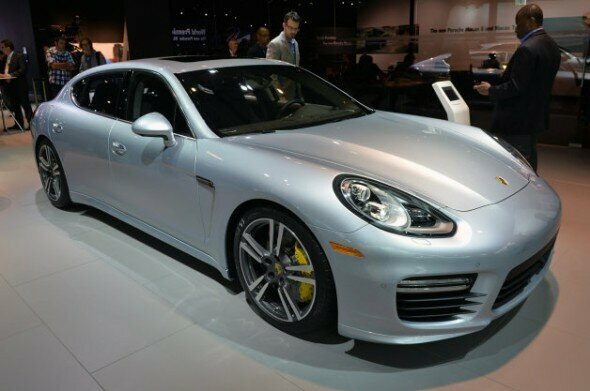 2014 Porsche Panamera Turbo S is a 911 Turbo for the family man. In the event that the Porsche Panamera Turbo’s 520 horsepower and 189-mile-per-hour top speed aren’t enough to sate the appetite of the speed freak, Porsche has just given the auto show debut to the faster, more powerful Panamera Turbo S.
With 570 horsepower being pumped from a 4.8-liter, twin-turbocharged V8, the Panamera Turbo S promises even faster acceleration, hitting 60 mph in 3.6 seconds, a 0.3-second improvement over the standard Turbo. The top speed, meanwhile, climbs to 192 mph, which is kind of ridiculous for a car with four doors and a trunk. Other enhancements that come with this Panamera’s extra syllable include carbon-ceramic brakes and the entirety of Porsche’s active chassis systems, including Porsche Dynamic Chassis Control and Porsche Active Suspension Management. The performance goodies come standard, but that doesn’t mean the Panamera Turbo S is cheap. Pricing for the standard Turbo S starts at $180,300, while the Executive model, which adds 5.9 inches to the Panamera’s wheelbase starts at $200,500. That’s far from cheap, but the type of performance on offer takes some of the sting out cutting such a large check. Preparing a beachhead in the marketplace for the 2015 Porsche Macan crossover has been a years-long project for the German company. We’ve been hearing and reporting on rumors of the vehicle from its ideation stage and have covered the Macan’s birth thoroughly over the last 12 months. Porsche will offer the crossover in two flavors to start: Macan S (above in blue) and Macan Turbo (above-right in black). The S model will be fitted with a twin-turbocharged 3.0-liter V6 engine that makes 340 horsepower and will push the vehicle from 0 to 60 miles per hour in 5.2 seconds, then on to a top speed of 156 miles per hour. The Macan Turbo has even more impressive figures on all fronts: an all-new, 400-horsepower, twin-turbo 3.6-liter V6 engine; 0-60 mph in 4.6 seconds; top speed of 164 mph. Both models make use of Porsche’s seven-speed PDK dual-clutch transmission as standard. As impressive as these potent powertrains are the brakes Porsche is fitting to its new crossover. Six-piston monobloc fixed-caliper brakes live up front, grabbing 13.78-inch discs on the S model and tremendous 14.17-inch discs on the Macan Turbo. We’re expecting serious stopping performance, to say the least. The Macan is clearly positioned as a high-performance crossover with go-anywhere ability. 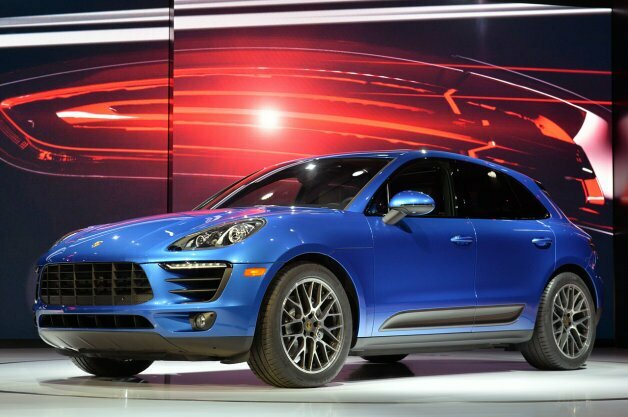 The Macan is clearly positioned as a high-performance crossover with go-anywhere ability. All-wheel drive is standard on both models, with Porsche Traction Management (PTM) equipped on all as well. The all-wheel-drive system sees the rear axle always coupled to the front via a multi-plate clutch, though Porsche says that up to 100-percent of “necessary” torque can be routed to the front, based on wheel slip. There is also a standard off-road mode for Macan, which alters shift points, pre-tensions the clutch and changes the front/rear torque split for low-traction conditions. Drivers can also activate an (optional) air suspension to gain an additional 1.58-inches of ground clearance, for a maximum of 9.06 inches. 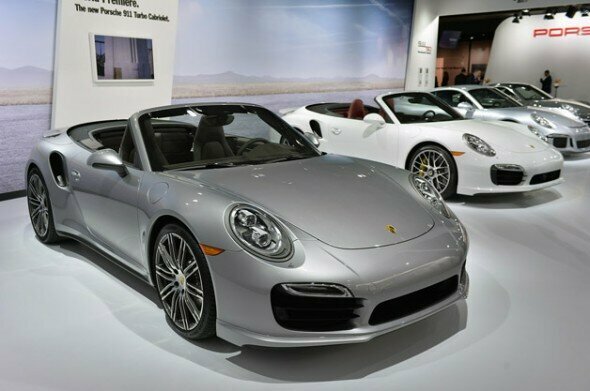 Porsche has just debuted its two latest decapitated rocket sleds today at the LA Auto Show, the new 911 Turbo Cabriolet and Turbo S Cabriolet, which share their coupe counterparts’ 520-horsepower and 560-hp 3.8-liter twin-turbocharged flat-six engines. That kind of power ought separate a lot of hats (and toupees!) from heads. The rear-engined Porsches put their power down through all four wheels, which allows them to launch from 0-60 in 3.3 seconds or less (the Turbo S Cab takes just 3.1 seconds), and both of them top out at 195 mph. The 911 Turbo Cabriolet starts at $160,700, while the Turbo S Cabriolet can be had for a grand total of $193,900 (plus $950 for destination). Is the S model’s 40 extra horsepower worth $33,200? We’re not so sure, but we imagine Porsche won’t have any trouble selling it. This entry was posted on Thursday, November 21st, 2013 at 12:58 pm. It is filed under Automotive, Featured Posts, News. You can follow any responses to this entry through the RSS 2.0 feed.